Ed Kashi -- photojournalist, filmmaker, educator, and member of VII Photo -- has dedicated his career to documenting social and political issues all over the world. In 2013, Kashi traveled to Nicaragua to document the epidemic of Chronic Kidney Disease of Unknown origin (CKDu) that has been decimating sugarcane workers in the country for the last few decades. He then went back in 2014, after successfully completing a crowd-funding campaign with the purpose of expanding his photographic work on the topic and adding a video component. We talked to him about his work in Nicaragua, his first crowd-funding campaign and how he sees photojournalism changing, from Instagram to other opportunities – and challenges – lying ahead. 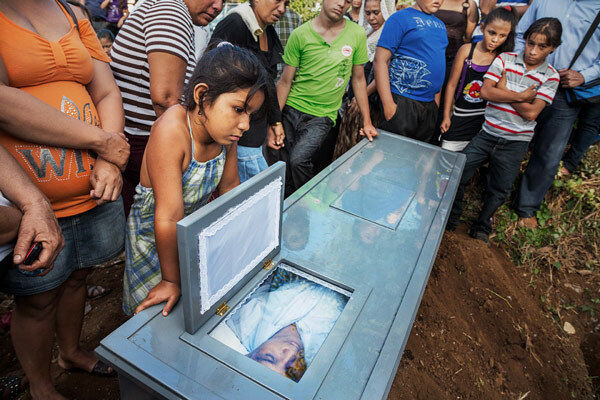 Family and friends gather for the funeral procession and burial of a former sugar cane worker, 36, who died of Chronic Kidney Disease of unknown origin (CKDu), after working in the sugar cane fields for 12 years in Chichigalpa, Nicaragua on Jan. 7, 2013. He is part of a steady procession of deaths among the cane workers in Chichigalpa, Nicaragua. Photograph by Ed Kashi; VII. Caterina Clerici: Can you talk about your project in Nicaragua with sugar cane workers and how you got started with it? 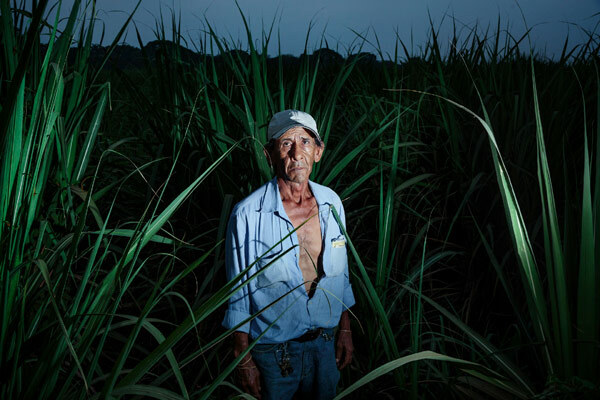 Ed Kashi: It’s about an epidemic of kidney disease among sugar cane workers in Nicaragua, although the disease has spread to other parts of Latin America as well, with more than 20,000 workers who are either sick or have died. It has now crossed the third-generation benchmark: their fathers and grandfathers all had the same problems. The project began in January 2013 when I started working with La Isla Foundation, a Nicaragua-based organization that has been trying to figure out what the disease really is and how to cure it. It began as a classic NGO assignment but I immediately got deeply involved and decided to go back. EK: I had already generated enough material during the first two trips but there was more to describe and I wanted to tell the story more deeply by introducing video because I knew it would have made a more powerful effect. With storytelling one can tell the bigger story: that these families are decimated and no one is doing anything. CC: This wasn’t your first time traveling to Nicaragua for a project. You were there in 1983, after the Sandinista revolution, to witness the struggle against the Contras following the overthrow of the Somoza dictatorship. How was it to be back 30 years later? EK: At the time, it was exciting. I was there as a young photojournalist witnessing what was a proxy fight between the US-backed Contras and the Soviet backed Sandinista government, a typical dynamic of the Cold War in South America. When I went back for the kidney project I was covering a health and human rights issue, not a political struggle. But the issue is still strongly political: the local media aren’t allowed to cover the story because the government is protecting the interests of the oligarchic sugar company. This is the proof that unfortunately nothing has really changed since the revolution. A former cane worker, 67, sick with CKDu, is photographed in the sugar cane fields that he worked in for 25 years, in Chichigalpa, Nicaragua on April 25, 2014. In 2013 he spoke out against one of the worker organizations, ASOCHIVIDA, and is now not receiving his food provisions. He also fought for the Sandanistas when he was 10 years old. Photograph by Ed Kashi; VII. CC: What was one thing that struck you about covering the kidney disease epidemic? EK: As a photojournalist, you sometimes have to look deeply to find your story or it takes some time to figure it out. In this case it was thrown at me: in the town we were in, there was a funeral every day. The evidence was around us. I was doing a series of portraits of people who had sick family members or ones who had died. I was in a neighborhood of Chichigalpa, often called the Island of Widows since one in three men are in end-stage of renal failure. It was like a refugee camp, with wooden run down houses and no running water. I thought of the similarity and then I thought ‘Wait a second, these people live here, they work here, this is unacceptable, it’s not supposed to be like a refugee camp.’ The injustice is appalling. CC: You decided to “crowd-fund” your way back to Nicaragua. How did that work? EK: The idea came through the Photo Society, which supported the project. I was one of their three “guinea pigs,” together with Amy Vitale and Catherine Karnow (also members of the Photo Society). I launched the crowd-funding campaign with Indievoices in December 2013 and thankfully it was successful, so I went back in April and May 2014 for two weeks. I brought Jessey Dearing (a photojournalist and filmmaker who works with Talking Eyes Media) with me to shoot video because I really felt this story needed to be told using both visual media, still photography and moving images, and I wanted to do a short documentary. I’ve been working on the production of the short film last month and I would like it to be a precursor to a 60-90 minute documentary, maybe also taking the project to El Salvador. A sugarcane plantation there has said they would be willing to take on the recommendations to stop the disease, so it would be a wonderful addition to the story. CC: How did you feel about the crowd-funding? EK: It was the first crowd-funding for me and initially I thought ‘I don’t know if I’d do it again.’ On one hand it’s exciting and innovative, almost revolutionary in the way that it allows us to not rely on media companies. On the other hand it makes projects even more personal (almost polluting: ‘I gave money to that person but they didn’t contribute to my project!’) However, I’ll soon be working on another Human Rights Watch project for which I actually appeared in the crowd-funding campaign – so I technically did it again (laughs). CC: Talking about new ways of approaching photojournalism and documentary photography, the Open Society Foundation recently asked you to be the first photographer to take over their Instagram feed. Can you talk about that experience? EK: I had taken over the New Yorker’s Instagram feed three times, then also once with Time and once with NBC, so I had a bit of experience already. But with OSF it was different: I was the first photographer to use it and it was humbling. All the other times I was just documenting what was going on where I happened to be or a breaking news event. This time it was a thoughtful process, I basically laid down a photo-essay in a week. Instagram can be a source of innovation but also of experimentation. CC: How are you trying to bring innovation into your own agency, VII? EK: We’re in a phase of transition and trying to figure out how to make it more profitable and sustainable, how to get more editorial work, NGO work, exhibitions, while at the same time keeping the standards high. The good thing about it is being a group: we recently worked on a collaborative project, “Smile”, an exhibition that premiered at One Financial Center in NYC exploring the idea of smile through the VII archive. We also often work together on production projects (with MSF and ICRC) or on mini-collaborations, like the one Ashley Gilbertson and I did for the New Yorker (cowboys experiencing the draught in Oklahoma.) We also recently did a flash-print sale for one week and plan on doing another in a couple of months with a different group of our photographers. It’s still a very difficult time, but it’s a challenging one. CC: How do you think photography has changed over the past few years and what advice would you give to young photographers who are starting out now? EK: Forty or fifty years ago, if you were a photojournalist publishing in the big picture magazines, you were bringing the world to people and were in uniquely privileged positions and were celebrated. In the 1970s there was the first hit against this profession with the Vietnam war being the first live televised war, and by the 1980s there were fewer outlets for long-form storytelling. Then in the 1990s and 2000s the digital revolution changed everything. We all knew it, but we could never have anticipated how rapidly things would change. At the same time though, there are so many opportunities now, coming from all sorts of different places: audio, video, shooting with your phone’s camera – you just need to be flexible and adapt and be able to reinvent yourself. But the onus is on you: you have to have a strong style and vision and an eye for great stories that the media will want. It’s never been easy, it’s never been harder, but at the same time there have never been more opportunities. And you’ve got to believe in doing it: if you don’t have the stomach for it, then it’s not the right profession for it. CC: As a final note, we asked SDN Founder and Director Glenn Ruga to comment on Ed Kashi and his role in the documentary community. Glenn Ruga: Ed is a tireless advocate of using the documentary form to tell important stories in this world. In addition to being extraordinarily prolific in his own work, he also finds time to be on the SDN Advisory Committee and also support many other organizations involved in documentary. But Ed also keeps his eyes on the big picture and fundamentally knows that what matters most are the people whom he photographs, whether in Nigeria, Nicaragua, Madagascar, or in his own back yard in New Jersey. All of us should feel tremendous gratitude to Ed for what he does for this medium.